This handy two-sided bookmark has been translated into Mandarin Chinese. It is printed in purple ink and is 9 ½” long and 3 ¾” wide. Side 1 gives facts about lupus, ranging from a description of the disease to who is most at risk, and includes information about the LFA and its services. 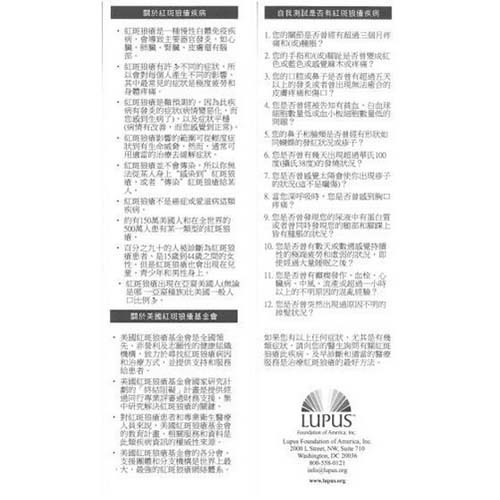 Side 2 offers a series of 12 questions that can help a person decide if they have symptoms that point to lupus, as well as the LFA logo, address, and toll-free number to call for information. This is the perfect item to give away at fundraisers, health fairs, awareness events, education seminars, or any public forum. Sold in packs of 100.